Prime Minister Arseny Yatseniuk said on Monday Ukraine's new government planned to cut budget spending, and set out plans that would amount to a reduction of about 14 to 16 percent. He made his remarks in comments to businessmen as Ukraine prepares for talks with the International Monetary Fund on financial assistance to avert the danger of bankruptcy. The escalating Ukraine crisis rocked global financial markets Monday, driving up oil prices significantly and sending investors rushing into perceived safe-haven assets such as the yen, while they cut their exposure to stocks. In European trading, Russian markets saw the heaviest losses after Moscow authorized an increase in the number of troops present in Ukraine's Crimea region. The Russian ruble hit a record low against the dollar and euro, prompting the Bank of Russia to raise interest rates Monday. The benchmark Micex stock index slumped over 11%, with construction firm Mostotrest OAO and metals and mining company Mechel OAO leading the falls, both dropping well over 20%. Gazprom, which has a large weighting on the index, was down 14% while Sberbank was off 18%. "The first risks investors are getting out of are Ukrainian and Russian risks," said Paul Lambert, head of currencies at Insight Investment in London, which manages around $450 billion of assets. In Ukraine itself, the yield on its 10-year dollar-denominated bond was at 10.33%, having earlier leapt more than a percentage point from Friday's close to 10.53%. The yield on the dollar-denominated Ukrainian bond maturing in 2014 meanwhile surged by 17 percentage points to 43%, according to Tradeweb. Bond prices and yields move in opposite directions. Ukraine's currency, the hryvnia remains extremely weak and was most recently quoted at 10 against the dollar, around 22% weaker than where it started the year. "This uncertainty isn't likely to dissipate soon," said Rob Drijkoningen, co-head of emerging market debt at Neuberger Berman. "Ukraine faces some important economic problems—lack of growth, an overvalued currency, and dwindling foreign-exchange reserves—but given the latest developments, the new government's attention has been focused on dealing with Russia rather than fixing imbalances," added Mr. Drijkoningen. According to the Ukrainian defense ministry, Russian fighter jets violated Ukraine's air space during the night over the Black Sea, Reuters reported early Monday morning. According to the ministry, Ukrainian forces reportedly scrambled interceptor aircraft and prevented any 'provocative actions' during the two violations of Ukraine's air space. Russia's military activities on Ukrainian soil are unacceptable but international diplomacy must prevail to solve the crisis, German Foreign Minister Frank-Walter Steinmeier said on Monday. "Crisis diplomacy is not a weakness but it will be more important than ever to not fall into the abyss of military escalation," Steinmeier told reporters ahead of an extraordinary meeting of EU foreign ministers in Brussels. Steinmeier suggested an fact-finding mission by the OSCE, Europe's main human rights and democracy watchdog, as an initial response. "We are considering whether it wouldn't make good sense to create transparency about what is happening on the ground in eastern Ukraine and Crimea instead of being dependent on rumours," he said. Roskomnadzor said in a statement published online Monday that it had been ordered by the general prosecutor's office to shut down the pages on Russia's leading social media website, VKontakte. The agency said the groups "propagandized the activity of Ukrainian nationalist groups," and accused them of encouraging "terrorist activity" and "participation in unsanctioned mass actions." The largest pro-demonstration group, which has more than 500,000 members, was not accessible to users on Russian territory on Monday. While much of Russian media is state-controlled, the Internet has so far remained largely free from censorship and has provided an active forum for anti-government criticism. The Group of Seven major industrialized nations on Sunday condemned Russia's intrusion into Ukraine and canceled for now preparations for the G8 summit that includes Russia and had been scheduled to take place in Sochi in June, the White House said. We, the leaders of Canada, France, Germany, Italy, Japan, the United Kingdom and the United States and the President of the European Council and President of the European Commission, join together today to condemn the Russian Federation’s clear violation of the sovereignty and territorial integrity of Ukraine, in contravention of Russia’s obligations under the UN Charter and its 1997 basing agreement with Ukraine. We call on Russia to address any ongoing security or human rights concerns that it has with Ukraine through direct negotiations, and/or via international observation or mediation under the auspices of the UN or the Organization for Security and Cooperation in Europe. We stand ready to assist with these efforts. British Prime Minister David Cameron warned President Vladimir Putin on Sunday that Russia would pay significant costs unless the Kremlin changed course on Ukraine. Cameron said he had agreed with U.S. President Barack Obama that Russia's actions in Ukraine were completely unacceptable, a Downing Street spokesman said. "They agreed that Russia's actions were completely unacceptable. They agreed on the urgent need for de-escalation and for Russia to engage in a dialogue directly with Ukraine," the spokesman said. 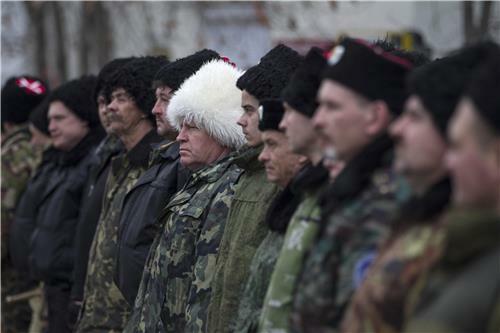 "They agreed there must be 'significant costs' to Russia if it did not change course on Ukraine," the spokesman said. Oh snap. Senior US official: When it comes to soft power, Putin "has no game." Russian Prime Minister Dmitry Medvedev said on Facebook on Sunday that Ukraine's leaders had seized power illegally and predicted their rule would end with "a new revolution" and new bloodshed. Medvedev said that while Viktor Yanukovich had practically no authority he remained the legitimate head of state according the constitution, adding: "If he is guilty before Ukraine - hold an impeachment procedure ... and try him." "Everything else is lawlessness. The seizure of power," Medvedev said on his Facebook page. "And that means such order will be extremely unstable. It will end in a new revolution. New blood." #Russia 's Prime Minister predicts "a new revolution" for #Ukraine . Update: #Russia 's Prime Minister says his country willing to work with #Ukraine - but not with its current leaders. In a Facebook post, Russia Prime Minister Medvedev says Ukraine's new leaders have seized power and predicts their rule will be very unstable and 'end with a new revolution' and more bloodshed, Reuters reports. NATO warned Russia on Sunday that military action against Ukraine was against international law, and expressed grave concern over the Russian parliament's authorisation of the use of force. "We urge both parties to immediately seek a peaceful solution through bilateral dialogue, with international facilitation ... and through the dispatch of international observers under the auspices of the United Nations Security Council or the Organization for Security and Cooperation in Europe," NATO said in a statement. In response to Ms Merkel's concern regarding the developments in Crimea and Ukraine as a whole, Vladimir Putin drew the Federal Chancellor's attention to the unrelenting threat of violence by ultra-nationalist forces, endangering the lives and legitimate interests of Russian citizens and the entire Russian-speaking population. It was stressed that the measures being taken by Russia correspond fully to the extraordinary current situation. Mr Putin and Ms Merkel agreed to continue consultations both in the bilateral format (through the two nations' Foreign Ministries) and multilaterally to promote the stabilization of the situation in Ukraine. In a statement to the media following a meeting of the NATO-Ukraine Commission, NATO Secretary-General Anders Fogh Rasmussen condemned the deployment of armed forces by Moscow and urged Russia and Ukraine to seek a peaceful resolution to the Crimean crisis through dialogue under the auspices of the UN Security Council or OSCE. "Military action is a breach of international law," said Rasmussen. "Today, NATO made clear that we stand by Ukraine as a valued partner and that we stand by the norms and principles of international law." Rasmussen called upon Russia to honor its international commitments and to withdraw its forces to its bases while refraining from any interference elsewhere. President Barack Obama plans to speak to allies about the Ukraine situation today, White House spokesman Josh Earnest said on Sunday. "The president's been working on this issue today," Earnest told reporters. "He has calls planned with our partners and allies in other countries." 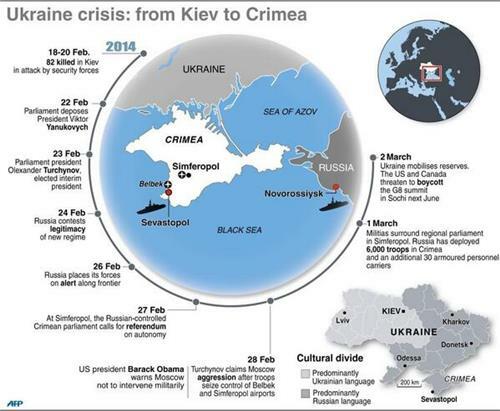 This infographic from the AFP provides a nice chronology of the events of the last few weeks, from the protests in the streets of Kiev to the current tensions between Ukraine and Russia. British Foreign Secretary William Hague has arrived in Kiev. At Slate, Joshua Keating writes that several 2006 US diplomatic cables, part of the 'Cablegate' cache released by Wikileaks, may have foreshadowed the current scenario between Ukraine and Russia. "A 2006 cable under the name of Kiev Deputy Chief of Mission Sheila Gwaltney, who as it happens is now the highest ranking diplomat at the U.S. embassy in Moscow following the departure of Amb. Michael McFaul, warns of a possible Russian threat to Crimea – Ukraine’s 'soft underbelly,'" writes Keating. Discussions with a wide range of contacts in Crimea November 20-22 and officials in Kyiv discounted recent speculation that a return of pro-Russian separatism in Crimea, which posed a real threat to Ukrainian territorial integrity in 1994-95, could be in the cards. However, nearly all contended that pro-Russian forces in Crimea, acting with funding and direction from Moscow, have systematically attempted to increase communal tensions in Crimea in the two years since the Orange Revolution. They have done so by cynically fanning ethnic Russian chauvinism towards Crimean Tatars and ethnic Ukrainians, through manipulation of issues like the status of the Russian language, NATO, and an alleged Tatar threat to "Slavs," in a deliberate effort to destabilize Crimea, weaken Ukraine, and prevent Ukraine's movement west into institutions like NATO and the EU. I am told @NATO council just ended, but shortly reconvening w/#Ukraine 's ambassador, formally NATO-Ukraine Commission. 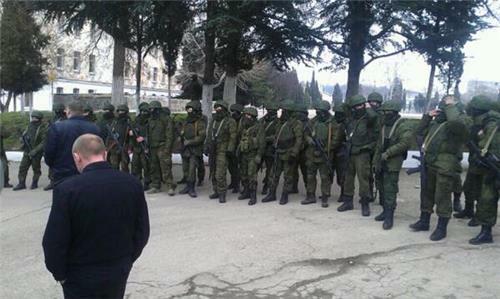 President Vladimir Putin submits proposal to parliament on the use of Russian armed forces in Ukraine's Crimea. Ukraine's acting president calls an emergency meeting of security chiefs. Russia's upper house of parliament approves President Putin's proposal. Vitali Klitschko urges Ukraine’s parliament to mobilize the army. UN Security Council holds urgent meeting on the crisis. 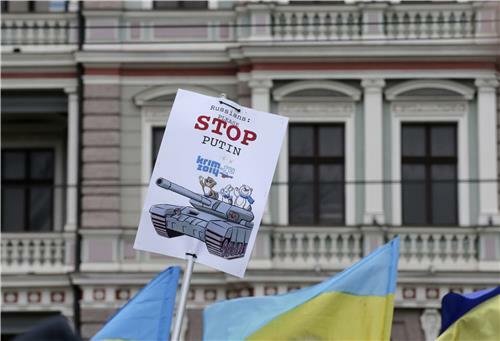 Ukraine's PM says military intervention could lead to war. United Nations Security Council meets in closed-door session. US President Barack Obama calls Vladimir Putin and speaks with him for over 90 minutes. US Secretary of State John Kerry condemns Russia’s invasion. Canada recalls its ambassador to Russia for consultations. Ukraine calls up all military reserves. Ukraine’s acting president says airspace closed to any non-civilian aircraft. Ukraine's PM accuses Russia of declaring war on the country. 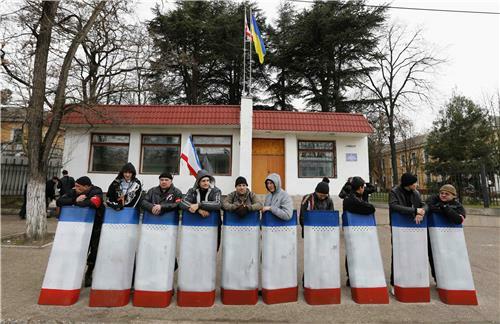 Hundreds of unidentified gunmen surround Ukraine military base, blocking soldiers from leaving. The US, France, Britain and Canada say they are canceling preparations for the G8 meeting due to be held in Russia in June. Ukraine’s Ambassador to the UN Yuriy Sergeyev says Ukraine is preparing to defend itself against Russia. 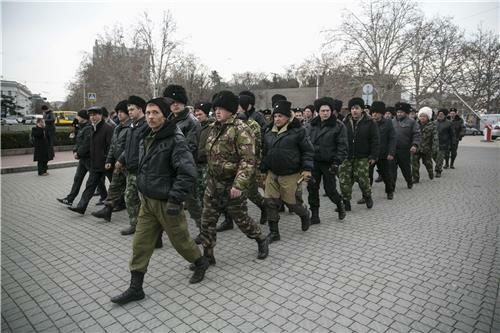 Army recruiting stations open across Ukraine. Ukraine's new prime minister demanded that Russian President Vladimir Putin pull back his military Sunday, as Ukraine called up all military reserves and Western powers angrily warned Moscow over Russia’s incursion into Ukrainian territory. "This is not a threat: This is actually the declaration of war to my country," said Prime Minister Arseniy Yatsenyuk, who heads the pro-Western government that took power in Ukraine after massive protests forced President Viktor Yanukovich, a Russian ally, from power a week ago. Yatsenyuk’s remarks came as a convoy of Russian troops rolled toward Simferopol, the capital of Ukraine's partially autonomous Crimea region, a day after Russian forces took over the strategic Black Sea peninsula without firing a shot. Also on Sunday, Russian forces surrounded several small Ukrainian military outposts in the Crimea and demanded that Ukrainian troops disarm. Some refused, and though there was no fighting the situation remained tense. Ukraine’s new government has called up all military reserves, and a senior security official said it was vital for the country’s military to be combat-ready as soon as possible. Kremlin spokesman Dmitry Peskov declined to comment on Sunday when asked for a response to harsh words from U.S. Secretary of State John Kerry, who condemned Russia's "incredible act of aggression" in Ukraine. "No comment at the moment," Peskov said. Kerry threatened "very serious repercussions" from the United States and other countries, including sanctions to isolate Russia economically, a day after President Vladimir Putin declared Russia had the right to intervene militarily in its neighbour. Friday night, Vasili Kryshko bought a pair of woodland green hunting waders. A friend accompanying him bought a long waterproof trench coat, also in camouflage, and they set off to serve their shift at the local self-defense battalion checkpoint, 20 miles outside the Crimean city of Sevastopol. Speaking from the checkpoint, Kryshko said it was set up a week ago to prevent “provocateurs” from Kiev and western Ukraine from coming into the city after three months of protests led to the ouster of president Viktor Yanukovich last Saturday. They are in communication with other battalions across the autonomous peninsula, coordinating security. Unhappy with the outcome of the protests in the capital and alarmed at the rise of Ukrainian nationalist groups in Kiev, many ethnic Russians in Crimea, who make up almost 60 percent of the population here, have been protesting and calling for Russia to come to their aid — with some even going as far as demanding their neighbor immediately absorb the territory. On Saturday afternoon, they may have gotten their wish. The new pro-Russia prime minister of Crimea asked Russian president Vladimir Putin for help safeguarding the Black Sea peninsula. Putin requested and received authorization from the Russian senate to use military force in Ukraine. 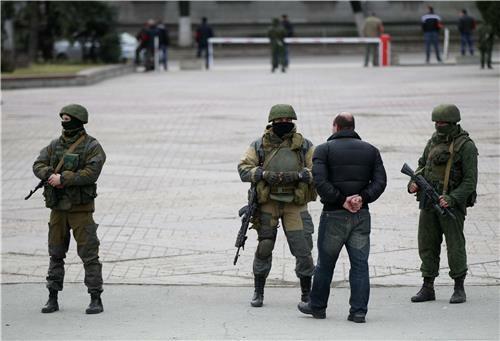 Already, professional-looking gunmen in neat, matching uniforms, widely assumed to be Russian troops, took over the capital's government buildings, two Crimean airports and the local television building. Read more from Al Jazeera America. U.S. Secretary of State John Kerry on Sunday condemned Russia's "incredible act of aggression" in Ukraine and threatened "very serious repercussions" from the United States and other countries including sanctions to isolate Russia economically. "You just don't in the 21st century behave in 19th century fashion by invading another country on completely trumped up pre-text," Kerry told the CBS program "Face the Nation." Kerry, however, added that Russia still has "a right set of choices" that can be made to defuse the crisis. Ukraine withdrew its coast guard vessels from two ports in Crimea and moved them to other Black Sea bases on Sunday, a sign that Russian forces were completing their seizure of the isolated Black Sea peninsula. In a statement, the border guards said vessels from the Crimean ports of Kerch and Sevastopol had been moved to Odessa and Mariupol. 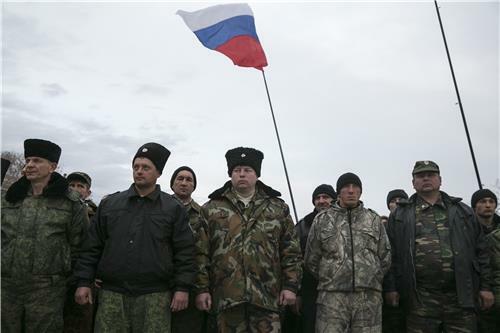 The situation on Ukraine's frontiers was stable apart from in Crimea, the statement said. Russian President Vladimir Putin has declared he has the right to invade Ukraine to protect Russian citizens. Russian forces have seized Crimea, where they have a naval base at Sevastopol, but have not entered other parts of Ukraine. Britain will suspend its participation in preparations for a G8 meeting in Sochi after Russia violated Ukraine's sovereignty and territorial integrity, British Foreign Minister William Hague said on Sunday. "The United Kingdom will join other G8 countries this week in suspending our co-operation under the G8, which Russia chairs this year, including ... meetings this week for the preparation of the G8 summit," Hague told reporters before boarding a flight to Kiev. "We call on both sides to ensure that there can be a reduction in tensions and the avoidance of conflict." France has suspended participation in preparatory meetings ahead of a G8 meeting of world powers in Russia's Sochi, a source in President Francois Hollande's office said on Sunday. "We have suspended our participation in the (G8) preparatory meetings," the source said. German Foreign Minister Frank-Walter Steinmeier said on Sunday the situation in Ukraine was "extremely dangerous" and he urged Russia to desist transgressions of Ukrainian sovereignty and territorial integrity. "It is urgently necessary that all those responsible desist from taking further steps that can only be seen as a provocation," Steinmeier said in a statement. "Anything else would lead to an escalation with uncertain, possibly dramatic consequences." Steinmeier also said Russia had no right to deploy its military in Ukrainian sovereign territory beyond the rules of the treaty on the Russian Black Sea fleet. Russia is threatening peace in European via its military actions in Ukraine and must immediately de-escalate tensions, NATO Secretary General Anders Fogh Rasmussen said on Sunday. "What Russia is doing now in Ukraine violates the principles of the United Nations charter. It threatens peace and security in Europe," Rasmussen told reporters in Brussels ahead of a meeting of NATO ambassadors. Rasmussen called on Russia to deescalate tensions and for all parties to "continue all efforts to move away from this dangerous situation". Ukraine called on Sunday for "real steps" by world leaders to help his country, saying it was on the brink of disaster and that Russian President Vladimir Putin's actions amounted to a declaration of war. "Any attempt to attack military installations is in fact direct military aggression against our country and the Russian military and the Russian leadership will be held responsible," Acting President Oleksander Turchinov said. 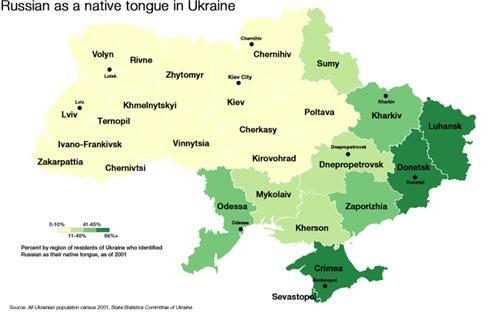 At Al Jazeera America, Hashem Said maps the geography of Ukraine's identity crisis. See more maps from Al Jazeera America. The Associated Press has an informative explainer of the cultural differences at the heart of the brewing conflict between Russia and Ukraine. If Ukraine looks neatly delineated on maps, its often-bloody history is a tangle of invasions and occupations, peoples and beliefs. It is a place that has been struggling for centuries to define itself. And now it finds itself so sharply divided — between support for Russia on one side of the country and loyalty to the West on the other — that it often seems more like two countries than one. 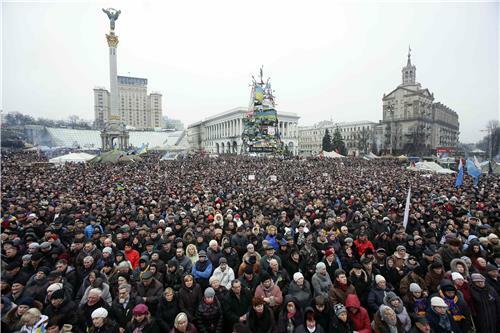 On opposite sides of Ukraine, two cities, each of about 1 million people, illustrate that divide. The eastern city of Donetsk can seem like a cliche of post-Soviet grimness, a place of Stalinist-era apartment blocks, tin-roofed shacks and loyalty to Russia. In the west, Lviv has emerged as a center for Ukrainian artists and writers, a huge draw for European tourists and a city desperate for closer ties to the West. To the fiercest pessimists, as well as to extremists on both sides, the cities are already in different nations. "The country is already separated," said Ivan Reyko, a 30-year-old factory worker from Donetsk who joined a recent demonstration of about 100 people in the city's main plaza, Lenin Square, where a 30-foot-tall statue of the Soviet hero gazes proudly toward the horizon. "There is no way back to a united Ukraine." A recent series of ominous signs has diplomats warning the region could easily stumble into widespread violence. 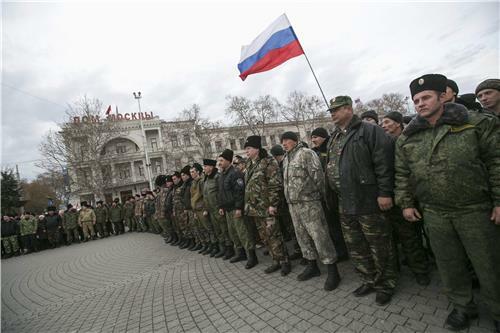 Among them: military drills just across the border by 150,000 Russian soldiers, and the seizure of the parliament building in the Russian-speaking region of Crimea by unidentified gunmen, who flew the Russian flag and chanted "Crimea is Russia." 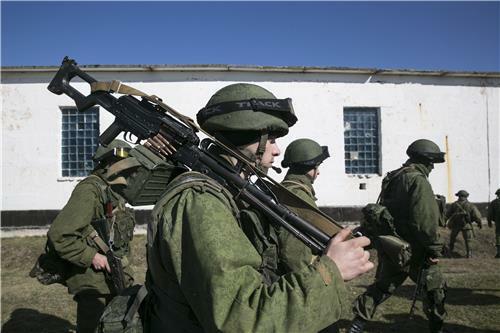 Russian military servicemen have taken weapons from a radar base and naval training facility in Ukraine's Crimea region and urged personnel to side with the peninsula's "legitimate" leaders, Interfax news agency said on Sunday. It quoted a Ukrainian Defence Ministry source as saying the Russian servicemen had taken pistols, rifles and ammunition cartridges from the radar post near in the town of Sudak and taken them away by car. Another group of Russian military had also removed weapons from a Ukrainian navy training centre in the port city of Sevastopol, where Russia's Black Sea Fleet also has a base. The governor of Russia's Belgorod region said on Sunday armed groups had tried to cut off a road leading to Ukraine, Interfax news agency reported. "Armed men are roaming the area ... There was an attempt to close off the road from Moscow to Crimea," Yevgeny Savchenko was quoted as saying about events on Saturday. "This is really troubling."